The recently released Honor 7X is off to a great start after its launch on January 22nd. Three days after its release, the phone is the number one best seller on Amazon. It is the first Honor handset to feature the FullView Display with a high screen-to-body ratio over 77%. The 5.93-inch screen carries a 1080 x 2160 FHD+ resolution, which works out to an aspect ratio of 18:9. The Kirin 659 chipset is under the hood, and keeping the lights on is a 3340mAh battery. Besides being available on Amazon, the Honor 7X can be purchased at hhihonor.com. This is the official Honor website where those in the states can make a prediction on the score of Super Bowl 52. The first 20 with the correct score will win Honor accessories or a $20 gift card. Three winners will receive a free Honor 8 smartphone. The Honor 7X is available for $199.99, a good price for a handset with an edge-to-edge display and a rear-facing dual-camera setup. 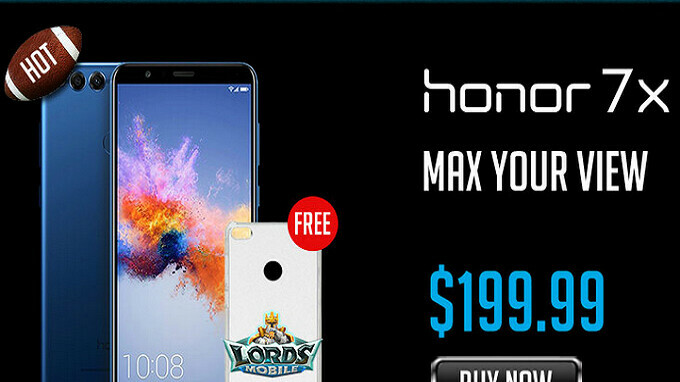 Honor is also offering the phone bundled with a plug that supports quick charge, and the Engine earphone for $221.97. The phone and the charger will cost you $206.98, while the phone and the earphone is priced at $219.98. Those purchasing an Honor 7X bundle will receive a free case for the phone. Wasnt this the device that some users on here were saying had some lag issues? May have been another device but I was pretty sure..
Nope, this 7x just has a slow SoC from 2016, that was overclocked to provide about 10% performance increase. Best value for your money!!! Nice work Huawei!! Wish it had a Snapdragon 6xx and stock Android. Hands down would have been the best 200 dollar phone out. I'm sure the Kirin is a great processor, but I don't know I've just not had the best experience with non snapdragon processors. It's still a great phone for the value no doubt. Qualcomm really need to setup up their mid range game in terms of price, they make incredible processors in the mid range but they are probably way too expensive for 200 dollar phones. Nice phone, but I'd wait for the Moto G6 if possible. I'd buy one if it were officially available in Canada.